On September 28, Santoshi Kumar, an 11-year-old girl in Simdega district of Jharkhand, died because of starving for nearly 8 days. Her family had not received any ration for months as their ration card was cancelled after being struck off the Public Distribution System (PDS) for not linking their ration card with Aadhaar. The system of Aadhaar has been under continuous criticism for ‘depriving the most vulnerable people of their grain entitlements’. Since a set of public interest litigations is pending in the Supreme Court urging it to intervene and stop the government from mandating the compulsory possession of Aadhaar, therefore, without going into the debates around Aadhaar, this piece discusses the larger issue of non-implementation of one of the basic rights - the right to food. The PDS in India is perhaps the largest distribution network of its type in the world. In spite of many programmes and schemes, there have always been concerns regarding food, hunger and malnutrition. The failure of the respective governments to implement the right to food has often intensified survival crisis of a huge percentage of the population, particularly in drought-affected areas. A public interest litigation filed by Swaraj Abhiyan, in 2016, before the Supreme Court had revealed that nearly 540 million, or 40% of the people in India, are in the grip of a drought. In the Right to Food case, the Supreme Court had ruled that it was the duty of the government to ensure no one went hungry. Subsequently, the apex court ‘issued a series of interim orders, defining rights and entitlements over food and related services, all keeping the poorest as their focus’. The court had also appointed commissioners to monitor implementation of its orders. Food security has been defined, by the World Health Organization (WHO), ‘as a situation when all people at all times have physical and economic access to sufficient and nutritious food that meets their dietary needs and food preference for an active and healthy life’. This implies that ‘the lack of a balanced diet minus essential nutrients results in chronic malnutrition’. The data from World Bank clearly indicates that ‘India has one of the world’s highest demographics of children suffering from malnutrition, said to be double that of Sub-Saharan Africa’. 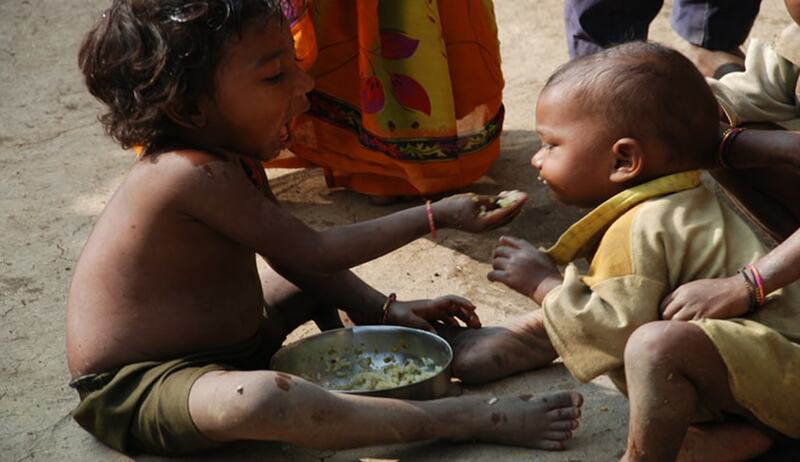 According to UNICEF, nearly half of all deaths in children under 5, in India, are attributable to undernutrition. The statistics are appalling. Drought and structural deficiencies have ‘left a large number of poor in the country at the risk of malnourishment in 2017’. This view has also been underlined in the writings of Nobel laureate Amartya Sen. In his book The Country of First Boys (2015), Sen has attributed the dire situation not to the lack of resources, but to the lack of political and social engagement. The death of the Jharkhand girl is not an isolated incident. It has been a consequence of ‘man-made starvation’, which has been caused because of the negligence and mis-governance on the part of ruling establishments. The Food Corporation of India (FCI) has enough stock of foodgrain to meet the requirement of Public Distribution System (PDS) and ensuring strategic reserve despite drought situation which has prevailed. Despite its self-sufficiency in food availability, and being one of the world’s largest grain producers, about one-fourth of Indians go to bed without food. Lakhs of tons of foodgrain have often been wasting away because there aren't enough warehouses for storage. In spite of being a food surplus country, India has not been able to curb foodgrain wastage. It is quite ironic that ‘a nation, which is riding high on various economic parameters to become the largest economy in the world in the upcoming decades, is still not able to come out from the dungeons of hunger and poverty’. The problems of hunger and malnutrition in India have been created by ‘structural poverty and inequality resulting in severe food insecurity’. The National Food Security Act (NFSA), 2013, enacted with the objective ‘to provide for food and nutritional security in human life cycle approach, by ensuring access to adequate quantity of quality food at affordable prices to people to live a life with dignity’, was envisaged to cover about two-thirds of the population. In Swaraj Abhiyan vs Union of India (2016), the Supreme Court made it clear that: “[T]here can be no doubt that the right to food is actually a constitutional right and not merely a statutory right… In any event, even if the right to food is a statutory right, it would be the obligation of the State to make all possible efforts and some more to ensure that to the extent possible, adequate food grains are available to all and particularly to those in drought affected areas.” The court had also warned that “[i]t is high time that the machinery under the NFS Act is put in place by all concerned otherwise the enactment of social justice legislations will have no meaning at all”. Therefore, the governments, after enacting legislations, cannot run away from their obligations towards the marginalised. Hunger is ‘incompatible with democracy in any meaningful sense of the term’. Indian democracy must hang its head in shame for every death which is caused due to hunger.